Laurie Strode, now the dean of a Northern California private school with an assumed name, must battle the Shape one last time and now the life of her own son hangs in the balance. This is one of two Stan Winston Michael Myers masks used in the 1998 film Halloween H20 and the actual mask seen in the film when Michael is decapitated. 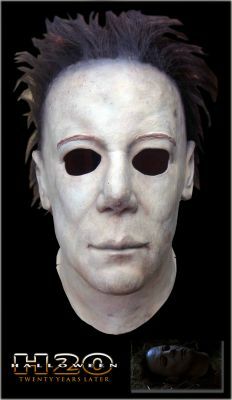 This mask can be seen in the finale when the police come and put Michael's corpse in a body bag, loading it into a coroner's van. Laurie, knowing that Michael is extremely difficult to kill and not believing that he is really dead, grabs the ax from earlier and an officer's gun, and she steals the van. While driving away, Michael sits up and escapes the body bag. She slams on the brakes, throwing him through the windshield. She then tries unsuccessfully to run him over. The vehicle tumbles down a cliff but she escapes, while Michael gets pinned between the van and a tree. Laurie recovers the axe and approaches him. He reaches out to her, apparently seeking forgiveness and compassion. At first it seems she will accept this, and begins reaching out to him, but then she slowly pulls her hand back and decapitates Michael, finally killing him.